Despite the introduction of new web frameworks, .NET framework remains important among developers. Released in 2002, .NET remains one of Microsoft’s most successful application development frameworks, with over 25,000 developers and 1,700 organizations actively contributing to the platform. .NET is comprised of Framework Class Library (FCL) and Common Languages Runtime (CLR), two key components that constitute the framework. FCL is a comprehensive library of classes, value types, and interfaces that can be reused, while CLR is an application Virtual Machine (VM) component that handles the execution of .NET programs. .Net’s most important attribute is that it offers interoperability across various programming languages. What Is the Riskiest Assumption Test and Why Are Startups Embracing It? The Riskiest Assumption Test, also referred to as RAT, is a new take on the well-known Minimum Viable Product (MVP) method in the product development world. In this post, you’ll learn about the Riskiest Assumption Test and why startups are beginning to embrace this method over an MVP. The Riskiest Assumption Test validates the riskiest assumptions of a startup. To truly understand the RAT, let’s first revisit the Minimum Viable Product. The MVP normally begins by developing a marketable product with the minimum possible characteristics. Every market niche has competitors who vie for customers’ attention, making it necessary for businesses to aggressively promote itself using online and offline platforms. Modern businesses employ a host of graphic designs to impact customers, such as creating eye-catching logos, websites, designer business cards, brochures, and mobile apps. A contemporary website design that makes a lasting impression on visitors can turn them into loyal customers. Similarly, a professionally-created brochure that highlights the main features of products or services can help customers make informed buying decisions. Integrating APIs on your website can propel your business to the next level by efficiently gathering useful data and increasing your website functionality. More than 16,000 APIs are available right now, making it easier than ever for businesses to integrate an API on their website to begin gathering valuable data and improving their website’s user experience. Rather than creating new programs that are specific to your business and site, APIs help improve your existing platform, increasing speed and making them easier to use. APIs get rid of unnecessary steps and provide access to new techniques without creating an entirely new program. Website redesign is often non-negotiable. When your website’s performance starts failing, a redesign is necessary to reverse the pattern. How to redesign your website, however, will likely spark debate – especially when it comes to what resources you’ll use. There are two main options for redesigning a website: an in-house IT team or an outsourced team of designers and developers. The right solution for your company will depend on the skills and resources your in-house team possesses, as well as the scope of your project. By evaluating these factors, you can decide if outsourcing is right for your business. Use this guide to help your company make the right decision for its next website redesign. The first step in redesigning your website is measuring the scope of your project. This will help you determine if you need in-house or outsourced resources. If you want your app to succeed, being featured on the Google Play Store is an important step. 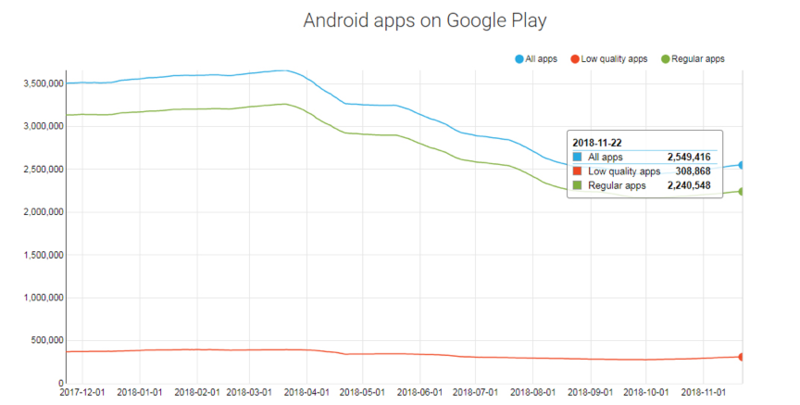 But with more than 2.5 million apps currently available on the Google Play Store and more than 1,300 apps joining the list per day, the competition for getting an app noticed by the majority of users is getting stiffer day by day. The total number of Android apps available on the Google Play Store exeeds 2.5 million as of November 2018, according to AppBrain. In 2015, the number of mobile device users surpassed the number of desktop users in the workplace. IDC predicts that, by 2020, 105.4 million workers in the US will be mobile, which accounts for over 72% of the total workforce. As mobility continues to grow, every organization should be engaged in mobility projects to support this type of workforce. Mobility projects are those that improve the way organizations work using mobile technology. Typically, these projects focus on how businesses interact with customers and access valuable data. Implementing mobility across a company can be challenging as leadership evaluates how to deliver the hardware, applications, and data to users in a secure way. Outsourcing software development has never been easier for companies looking to build cutting-edge technologies and launch state-of-the-art applications and platforms. In fact, among large companies, the average percentage allocated to outsourcing in IT budgets rose in 2018. While more advanced technologies, cloud capabilities, and collaboration tools continue to evolve to make transnational software development viable, human factors may still present the greatest challenge to outsourced engagements.